This is all the free stuff we got today using coupons. We Saved 75 % on our shopping last month using coupons, sales and discounts. I really appreciate that my husband is willing to not only help me clip coupons but use them as well. Some of the sites i use for couponing are: http://www.couponmom.com/ This site price matches the weekly coupons with sales at local stores. I love this site as it is free. Another site that does the same thing http://www.savingsangel.com/ charges a monthly or weekly fee after signing up so i did not sign up for it. I get my coupons by buying a weekly sunday Grandrapids Press and by asking others to save there coupon section for me. When my coupons expire there is a list of military families on coupon mom.com to send my expired coupons to. They can use them at the commisary after being expired. 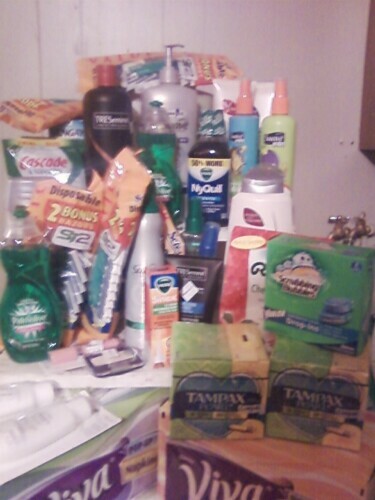 I recently found out that I can use 1 family dollar coupon and 1 manufacturers coupon per item at family dollar.